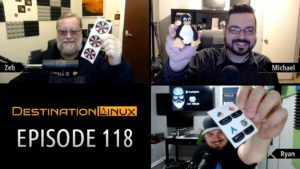 We have a brand new website up and running which is destinationlinux.org where you can find all the information you will need about each podcast including the vidcast of the show. You can also find out how to contact us through Email or our social links. Youtube pulled down 3 of our vidcasts for violating community guidelines. We appealed all three and they were put back up but as of the airing of this show, our channel is still under video upload restriction because of it. The Panel has a more cohesive feel to it? Is this all because of GTK3?